I didn’t want the typical lamp and shade and when I found these, they were perfect. They provide great light. The only negative comment is the inside of the globes cant be cleaned because the opening is not large enough to get a cloth inside. With its oversized bulb and striking silver finish, our Venice Table Lamps will illuminate any room with its industrial vibe. Comes with a 2-year warranty. Dimensions 23.0 In. X 14.0 In. X 7.0 In. This is a neat looking lamp. We really like the industrial feel that it gives are space and it provides excellent illumination. The only downside might be that it requires a special kind of bulb (Type B) that normally would be in chandeliers. Packaged very well~~~easy to unpack. Looks exactly as pictured, except the bulb that comes with it. I believe this lamp should have the old fashion, clear bulb so you can see the small fibers of the bulb. For me, no problems re balance and someone commented on it. I love it!!! very happy with these lamps. I purchased two and the look fantastic on our nightstands, just the right size for a bedside lamp. The quality is good and the clean design fits our modern/industrial style. I bought it for a reading lamp but it is not bright enougj for a good reading light. I like the style so will keep it for a table lamp. While this lamp is as it’s presented, the bulb is really bright. The glass is completely clear so there isn’t anything filtering the light from the bulb. Just a warning. I was going to use as a desk lamp but had to return. 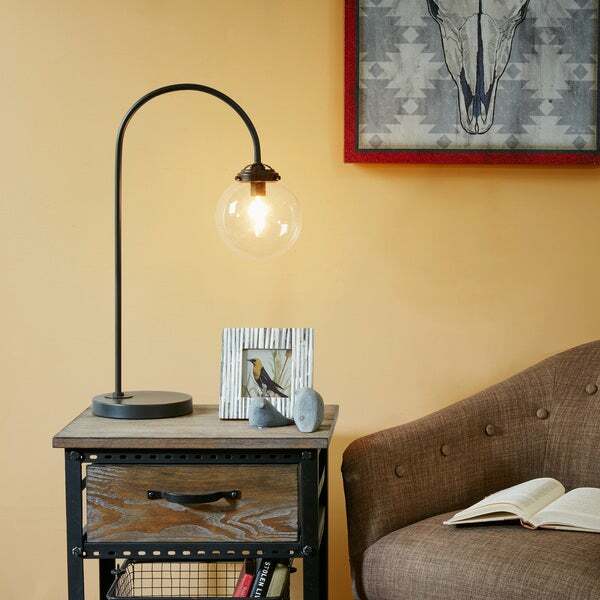 Love this lamp, however it was pretty bright for the living room. I will change out the bulb and I'm sure it will be fine. It is truly beautiful. Love it. The shipping was very quick. I love the look it’s sharp simple and offers exactly what I am looking for. What is upsetting is there’s no lightbulb that comes with it, and the switch is not on the side of the shady as it indicates, it’s actually on the cord, so I can be a little bit frustrating to reach over when trying to turn on and turn off the lamp. My lamp also came damaged on the bottom, I called overstock and they’re really great at requesting a replacement. I requested for UPS to pick up the package from my house because I don’t have time to make an exchange. Overstock was really good about offering that. Does not come with a light bulb and it is kind of hard to clean the glass peice. I really like this lamp I just feel it was a little overpriced. It’s as beautiful as it is in pictures. We LOVE it. It’s rustic but not too much so that it doesn’t match almost any decor. It’s well made for sure!! Now I need to find a similar set of 2 in black for new bedroom set!! Requires 40 watt incandescent or CFL 9w bulb. 1.25 inch socket size. E12 socket type. I hope it helps. "What is the diameter of the oversized bulb? Does the 14in wide include the base and the bulb?" The shade is 5.5Dx6H. The 14in is the width of the base Heather: 14” is the overall width, it includes the base and the shade (not the bulb). The base width is 7D. "Where is the switch? On the base or on the shade?" The turn off switch is on the shade. "what is the base diameter?" The base is 7 inches in diameter and 1 inch in height. "Is this on a dimmer?"